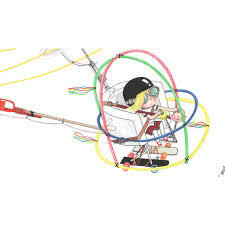 What happens to a little girl who wants to build things if her initial efforts are met with laughter? 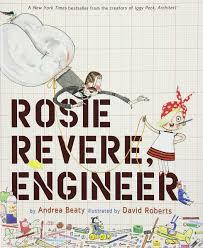 If the girl is Rosie, in Andrea Beaty’s delightful Rosie Revere Engineer, she sits quietly in school, never saying a word, then late a night, where no one can see, she sets to work. dear Rosie made gadgets and gizmos she loved. far under the bed, where they’d never be seen. Her creativity continues, but not in a way teachers or family members are likely to see. Rosie’s story reminds me both of the importance of self-efficacy in persistence (which she apparently had in abundance!) and also of the impact small acts of encouragement—or discouragement—can have on creativity in schools. The book ends with a busy class of second graders building “gizmos and gadgets and doohickeys, too,” celebrating each perfect failure, then going on to the next. Rosie Revere Engineer is a perfect beginning-of-the-year book for building a classroom atmosphere that supports the risk taking (and failure) necessary for creative efforts. Take a look, and if you love Rosie, you may want to explore Beaty’s other books including Iggy Peck Architect and Ada Twist Scientist.